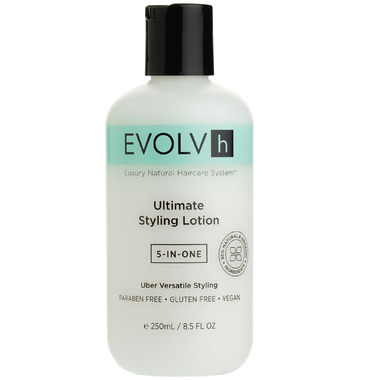 The EVOLVh Ultimate Styling Lotion is a 5-in-1 botanical formula that truly does everything: creates volume, holds style, de-frizzes, adds shine, and defines curls into smooth ringlets. Its an all-in-one amazingly lightweight lotion. Flax adds hold, volume and imparts shine. Mallow hydrates and supports moisture balance. Marigold adds shine and protects hair from environmental damage. To use: When styling for fullness and volume, apply from the roots out and blow dry hair off the scalp. For curly hair, apply sparingly from roots to mid-length and add slightly more product from mid-lengths to ends for beautiful, smooth ringlets. For air dried hair, let it sink in for a minute before styling as usual. Bonus: it can also be applied to dry hair to refresh lifeless locks. Ingredients: Atmospheric Water, pHytoBlend (proprietary concentrate blend of 20 herbs in an aqueous base), mallow, flax, marigold, chamomile, ncyclomethiconal, corn starch, citrus seed extract. After reading all the great reviews I decided to try this. I so wanted to like this but it did nothing for my hair. Tried it 6 times using more, less etc to no avail. I have very course hair and lots of it. Love this stuff! Would buy again. Really nice for curly hair. I use the complete line and other than the price I am so happy with it. Soft, bouncy and shiny curls with no "crunch".